Walmart Canada matching kettle donations on Saturday, December 14, 2018. December 12-14 annual Food for Fare Campaign from the City of Prince George & BC Transit. Angel trees are a way for the community to contribute gifts for children to the Christmas Hampers we are giving out in the next few weeks. Prince George comes up big again at the annual Teddy Bear Toss! Adopt-A-Kettle on now at Parker Optometry! Quinn came in to donate some much needed baby and food items. New kettle stands from Schultz-Craftsman! Wear your #HOPEbracelet today and let those who are struggling with poverty, homelessness and addictions know that you care. Preparations for our 2018 Kettle Campaign have begun. Thank you to all 317 Bikers who participated in our 37th Annual Toy Run. With your support, it will give hope today to over 400 families this Christmas. 37th Annual Motorcycle Toy Run this Sunday, September 30 in the parking lot of CN Centre. 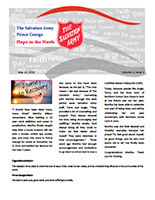 Volume 1, Issue 5 of Hope in the North is now available. Volume 1, Issue 4 of Hope in the North is now available. 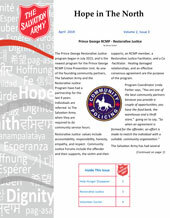 Volume 1, Issue 3 of Hope in the North is now available. Volume 1, Issue 2 of Hope in the North is now available. 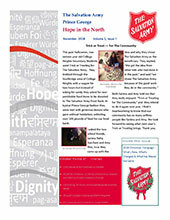 Volume 1, Issue 1 of Hope in the North is now available.